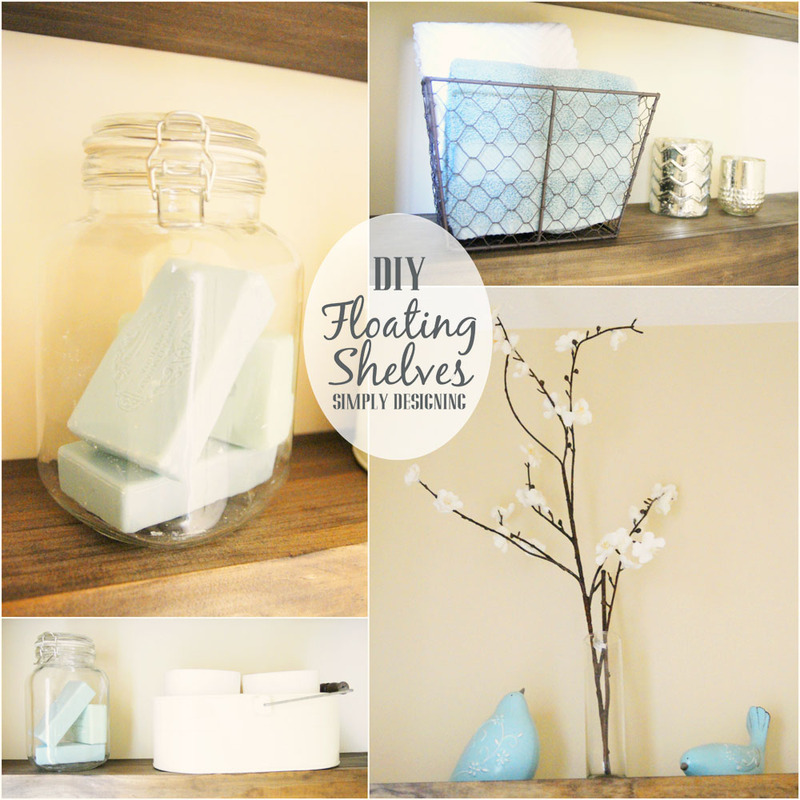 DIY Floating Shelves are really easy to make! 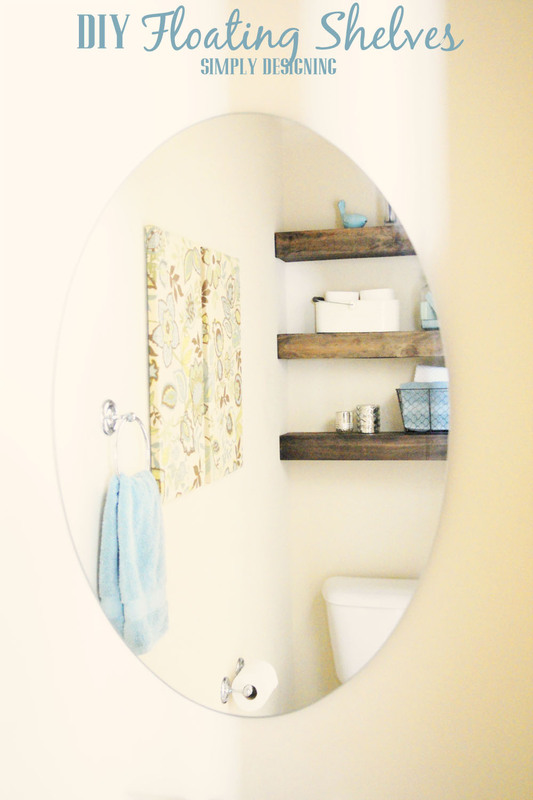 And they are the perfect shelves to build in a small, narrow half bath like I have. They take just a bit of patience because each cut will need to be measured out individually so that these fit snugly into your space. Recently I shared how we installed a herringbone tile floor in our half-bathroom with you! What I didn’t tell you was that we loved them so much, that we decided to do another project in the same bathroom! I had previously installed a little shelf above the toilet, and it was cute and fine. But I wanted something bigger, something more substantial, and I wanted an excuse to pull out my favorite Ryobi and Kreg tools and build! 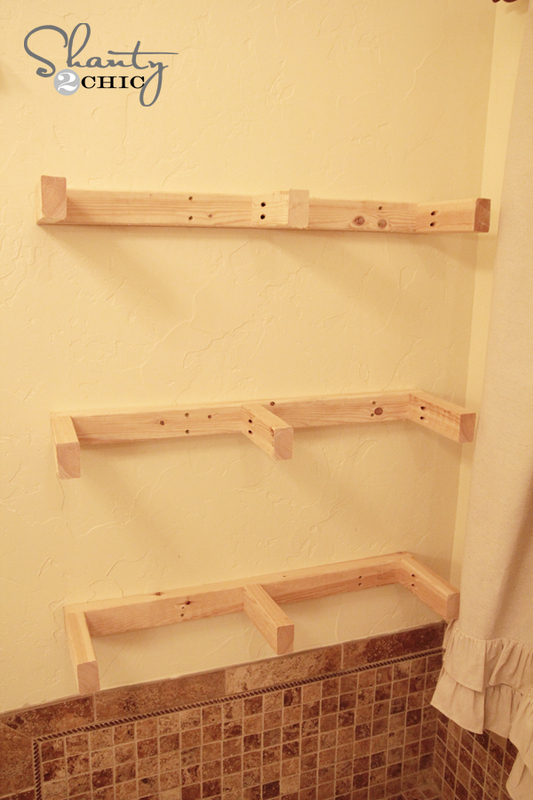 So I decided to build three Built-In Floating Shelves for my bathroom! But oh how they make my heart sing! I love love LOVE how these shelves turned out!! The best part about these shelves is that I actually think it makes my tiny bathroom feel bigger! Because my ceilings are high, and I added three shelves and tall decorations, when you walk into the room, the height of the shelves visually leads your eye up so you notice the height of the room. This helps it feel bigger. Which, is a great plus because it is a tiny room! 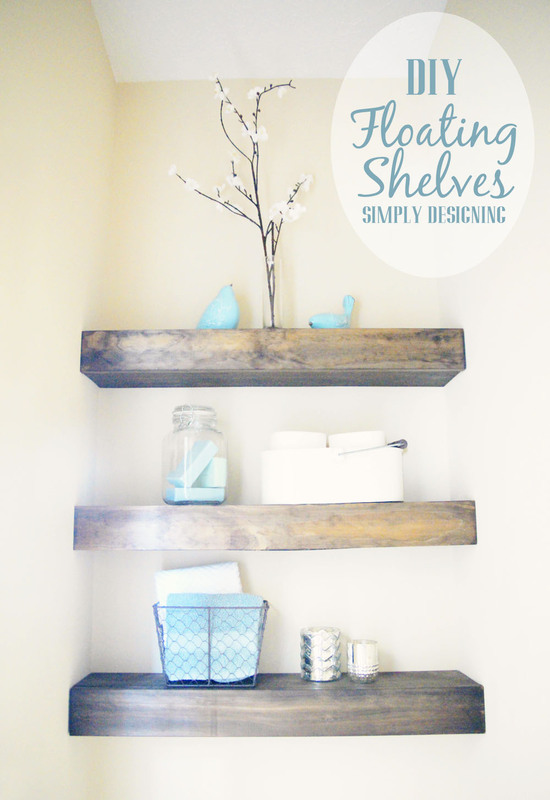 DIY Floating shelves are everywhere and there are many tutorials on how to create these. I had seen and pinned this inspiration from Desert Domicile over a year ago and used it as my basis for inspiration for these built-in shelves. Of course, I have to show you a BEFORE picture. See…my tiny little shelf!? It definitely needed to be replaced! 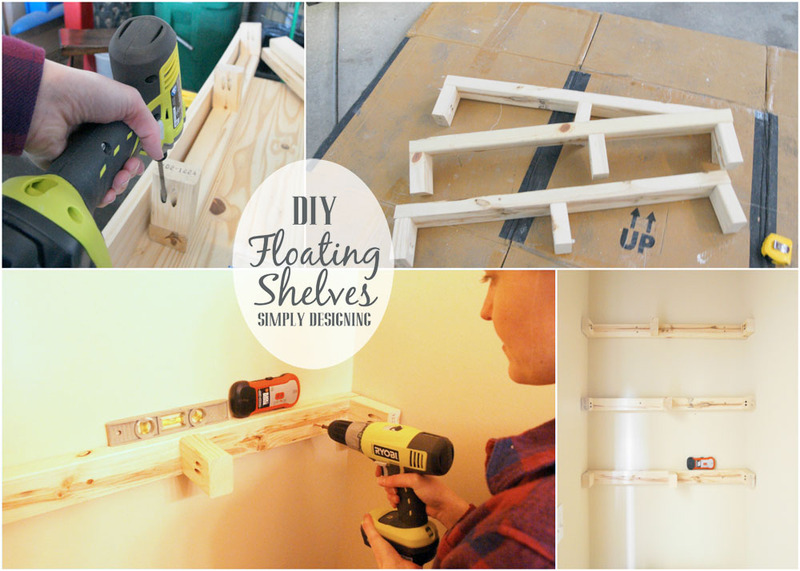 These plans are to create (1) floating shelf that is approximately 32″ long by 5.5″ deep. You may need to adjust your measurements and quantities accordingly. 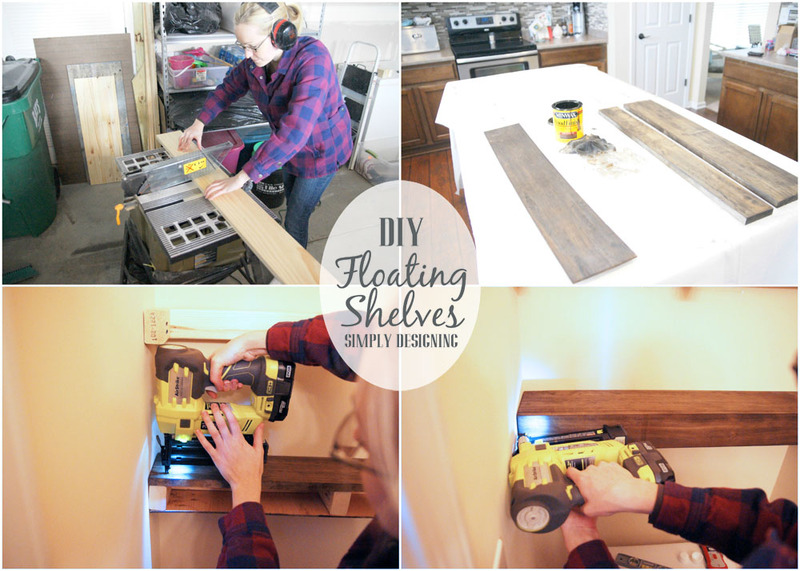 Instructions for DIY Floating Shelves. 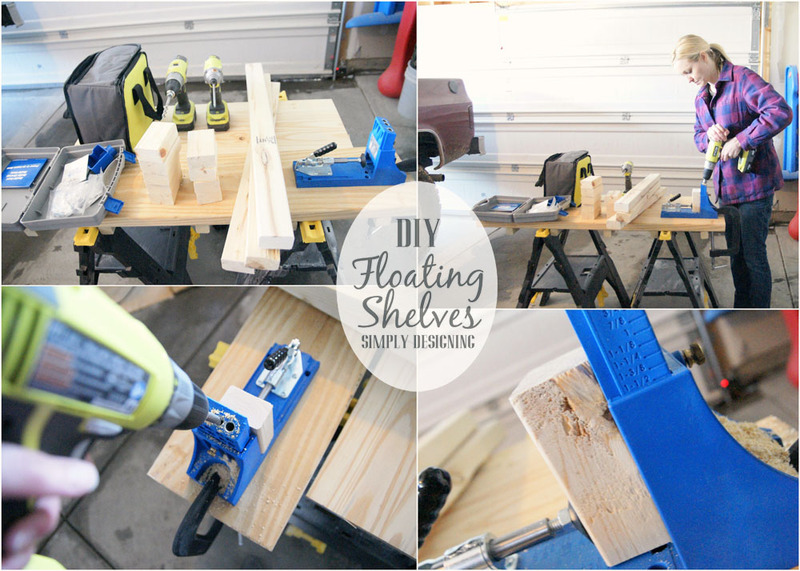 After you cut all of your lengths of wood you will start to assemble the inside of your floating shelf. A note about cutting your wood. Walls are not perfect. Let me repeat that. Walls. Are. Not. Perfect. Every single cut I made was slightly different because the walls are not perfectly perpendicular so you will need to measure twice and cut once, for every single cut you make. 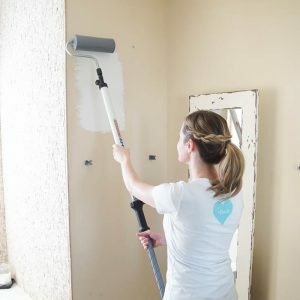 A 1/16″ difference does matter when you are creating shelves that fit perfectly in place, wall-to-wall, so take your time to measure and cut carefully. Set your Kreg Jig to 1 1/2″ and set your drill bit collar to the setting for 1 1/2″ as well. You are setting both of these to the actual thickness of your wood. And since a 2″ x 3″ is actually 1 1/2″ thick (not 2″), both of your Kreg Jig settings need to be set at 1 1/2″. Start by drilling two pocket holes into each of your 4″ long 2″ x 3″ pieces of wood. Then you will screw your 4″ long 2″ x 3″‘s into your 32″ long 2″ x 3″. One at each end and one in the middle-ish (no need to measure). You will basically be creating a tall and skinny E. Be sure to line the ends up well, it is helpful to have a second set of hands if possible, but a 90-degree clamp would work as well. After your “E”‘s are assembled, you will use your drill and your 3” screws to attach the shelves into your wall. When we were able to drill into a stud we did, when we couldn’t we added an extra screw for stability. We used 2-4 screws on each shelf to secure this into place. This doesn’t look very pretty right now, but this is the guts of your floating shelf. This is what enables you to have a floating shelf with no visual supports. But let’s get back to this photo of me 🙂 I have never used a table saw before. It was the one tool that still scared me a bit. But then my sweet husband threw out his back and wasn’t able to help me. So I worked up all my courage and cut my wood using the table saw all by myself. And guess what!? I survived! And actually, like most power tools, I really enjoyed using it! And the lesson I always learn when I try a new tool, GIRLS CAN USE POWER TOOLS TOO! 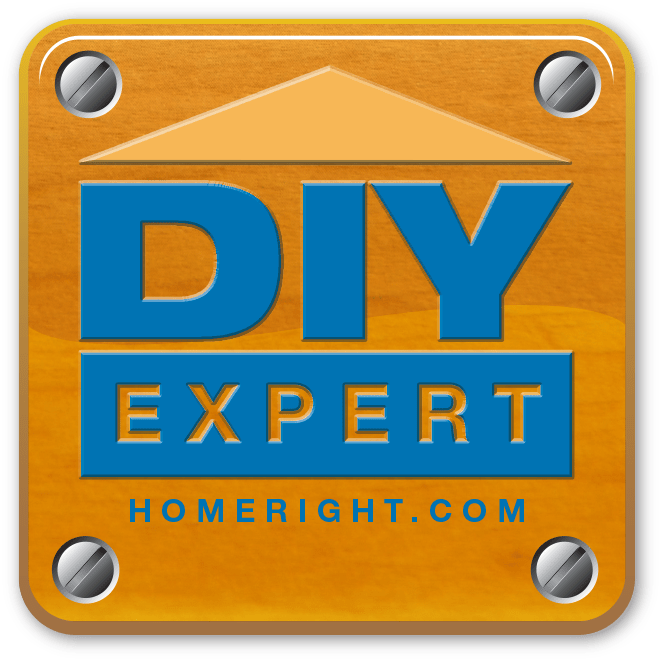 Be sure to sand your 1″ x 6″, 1″ x 4″ and your plywood really well and wipe them clean. Then stain those three boards and let them dry. Finally, use your Ryobi AirStrike to nail-gun your 1″ x 6″ board onto the top of your supports. Nail your plywood onto the bottom of your supports. 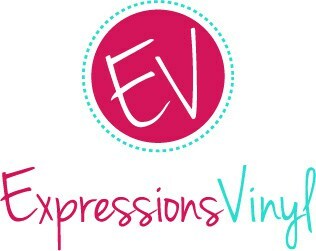 And finally, attach your 1″ x 4″ board onto the front of your shelf! 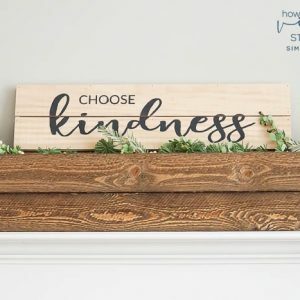 After my DIY Floating shelves were built, I couldn’t wait to decorate them! 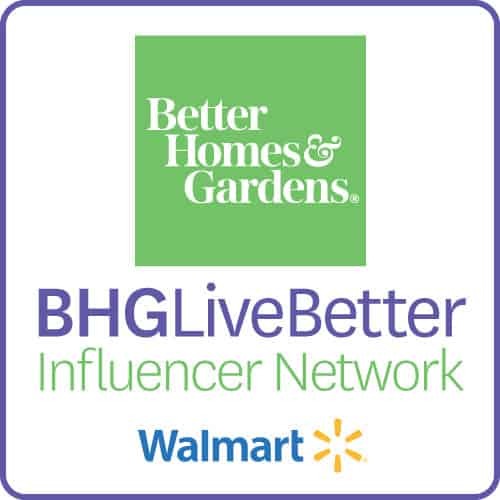 I used a few items I already had at home and I bought a few new items from World Market. Don’t you just love that store!? If you happen to come to my house, please feel free to take a peek at my newly remodeled bathroom! I am so proud of it and I would love to show it off!! This post appeared first on Simply Designing. All blog posts, text, and images are subject to my Privacy and Use Policy here. I participate in the link parties found here. Thank you so much Colleen!! So those deleted comments… advice on how to use the miter gauge properly? That picture made me cringe. Shelves look great, though! The miter gauge is properly in place. You can&#39;t see it because of the angle of the photo though. It is behind my left hand because my left hand is holding the wood securely in place to the gauge…so you can&#39;t see much of it. The part you can see is the same color grey as my garage floor! Thanks for stopping by! Love these shelves! Job well done! http://www.bowerpowerblog.com/2013/12/full-bodied-shelves/comment-page-1/<br /><br />And, you know, the post she already said she got the idea from. These look wonderful! Great work! They REALLY up the quality of the whole bathroom! Thank you Sarah! 🙂 And thanks for stopping by! Goodness, they are so beautiful! You did a great job. Oh thank you nest of posies! Gorgeous! They do make that space look bigger! I love these!! You did a fabulous job!!! Thank you Kristin!! And thanks for stopping by! I&#39;d LOVE to Diana!!! We&#39;d have way too much fun 🙂 Thanks for stopping by! And you&#39;re welcome! I love how you fit them in between both walls like that. I pinned that Desert Domicile image a year or so ago when I was going to do this in our old house but then we moved. Great minds think alike? 😉 You did a great job! Love it. Oh thank you! I know…it totally took me too long to actually get around to making them! Yes…great minds! You should still make some someday though!! 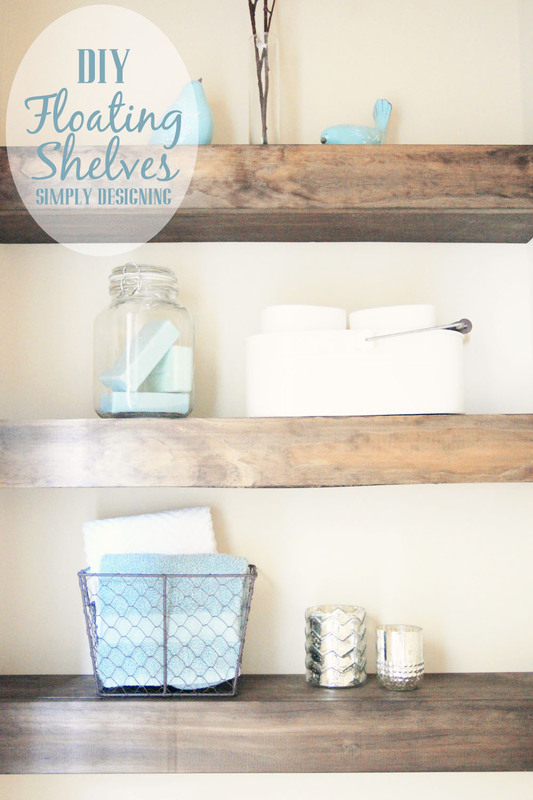 I love the look of the shelves and the big impact they made in your bathroom! Thank you!! It&#39;s funny how new flooring and new shelves completely changes my tiny bathroom!! Thanks so much for stopping by Katie! Love these!! I have had the same tutorial pinned since she posted em. I can&#39;t believe the difference it makes!! Thank you!! And thanks for stopping by and taking the time to comment! It means so so much to me!!! 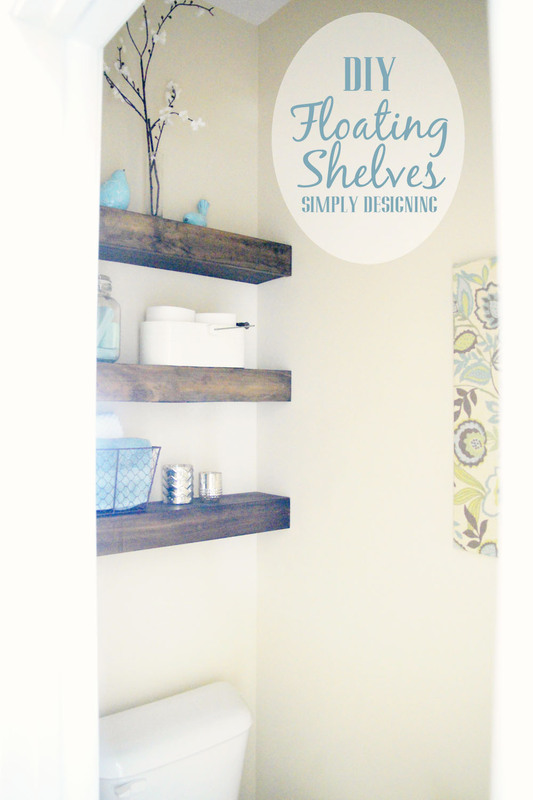 I love what you did with these shelves Ashley! Great ideas for my bathroom!! Thank you so much Abbey! And thanks for taking the time to stop by! Give that sweet baby of yours lots of love from me!!! Absolutely beautiful! Thanks for sharing your creation! Thanks so much Corey!! I bet your shelves look great! I will have to go and check them out!! Thanks so much for stopping by! All these shelves are looking amazing! Shelving is a great way to organize space. I love these DIY. I want to do similar in my room. I got some great ideas from this article. Thanks for sharing. These looks great! What color stain did you use?